Have a question not addressed here or interested in booking The Soenen Sisters ensemble for your event? Email thesoenensisters@gmail.com for more information or click here to go to the Contact form and receive details about pricing, group availability, etc. Q: Will a contract be provided? A: Yes, a contract which contains payment details etc. is mailed once the booking has been confirmed and/or the deposit has been received. Q: What are the musicians’ qualifications? A: All members of the Soenen Sisters are professional musicians who have been extensively classically trained and are active performers, having played for weddings and special functions for 10 + years. We are dedicated to giving 100% of ourselves and our music to make your wedding music unforgettable and unique. Q: Will musicians come to rehearsals? A: Musicians can come to rehearsals for an extra fee if the rehearsal location is not too far (mileage rates may apply). If you prefer, one musician can also come as a representative for the group. Q: Can the musicians perform outside? A: Yes, the musicians will play outdoors within reasonable, waterproof conditions. If the temperature is below 60 degrees or is hot and humid, a tent (provided by either the client or the group) or an alternate facility (such as a covered porch, shaded area, etc.) will need to be provided so that the musicians can protect their instruments/maintain tuning, etc. Also, sound production outside (regardless of ensemble size) is not an issue since string instruments project very well and the musicians always play out as much as possible. Q: Can pieces be performed that are not on repertoire lists? A: Yes, if selections are desired that are not in the ensembles’ current repertoire, they can be performed if music is provided by the client ahead of time (TIP: piano scores are sufficient as each player can choose a part that works for his/her instrument). A charge of $25 will be added for every piece not previously played by the ensemble. Also, The Soenen Sisters are pleased to offer a large and diverse music repertoire which includes all wedding and classical favorites in addition to jazz, contemporary/pop/celtic selections, and much more. Music guidance is also available throughout the selection process. A: The musicians can either wear something neutral such as all black or black and white or can wear something more colorful if preferred. All attire will be formal unless an alternative is requested. Q: When will musicians arrive for an event? 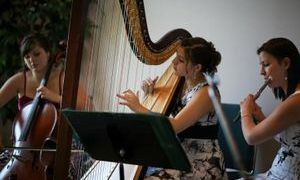 A: The musicians will arrive at least 30 minutes before the start of the event (ie: 30 minutes before pre-ceremony music is scheduled to begin for a wedding). Q: Will the musicians need a microphone/sound system? A: The use of a microphone is up to each client (depending on the size of the event space, sound preference, etc.) but are typically not needed since the instruments project well. Musicians are willing to use a sound system if provided/desired. Q: How will musicians know when to change selections during a wedding ceremony? A: The musicians will need cues from a wedding coordinator (or other individual) to know when the various processionals are set to begin. It is also helpful for the musicians to have a program or detailed script to follow during the ceremony as well as to know ahead of time how many people each processional will include. Q: What else will musicians need provided at an event? A: Armless chairs will need to provided (folding chairs are fine). Everything else (music, stands, etc.) will be taken care of by the musicians. Q: Can musicians accompany a friend/family member who will sing during the wedding/event? A: Yes, as long as music is provided by the client ahead of time that works for the specific ensemble hired, (if not already in repertoire). It is helpful for the musicians to be able to rehearse with the vocalist (right before the start of the event/wedding ceremony is fine). Q: Which forms of payment are accepted? A: Personal checks are the only forms of payment currently accepted (please make all checks out to Lisa Soenen, not The Soenen Sisters). Complete payment details accompany the contract and invoice which are mailed once an ensemble has been booked.